As winter weather approaches we get a lot of questions regarding keeping your bird warm. How to do it safely? What’s the ideal temperature for your pet parrot? Can I use a space heater? We want to address all these concerns and more. As soon as the temperature starts dropping my heat bill starts going up. When the heat bill goes up, I add an extra layer of clothing and turn the thermostat down to save some money on the heat bill. But what about the animals? My cats have thick fur coats, they’ll be ok. But parrot feathers don’t seem exactly warm, do they? Well, they probably are reasonably warm, but may not be warm enough for easy adjustment to quickly falling temps. Since I have Caiques and other South American species, I looked up the average temperature for their natural region. I found that the weather the wild birds acclimate to is 55 – 64 degrees Fahrenheit. Since my birds are indoor pets I don’t have to worry about dropping the temperature down that low. I keep my thermostat at about 68 degrees during the day and drop it down another notch at night. I do cover my birds at night in the winter months to help with added warmth and keep off any air that may be blowing on them when the heater kicks on. If you still don’t feel comfortable with your bird at cooler temperatures there are other alternatives. Heated perches are very popular. They are fitted so that the cord stays outside of the cage, and the perch heats up slightly to provide a warm place for your bird to roost. If you have a bird that likes to chew and destroy his perches, I would be wary of putting one in the cage. I know of other owners that purchase the ceramic heat emitters that are found in the reptile section of your petstore and use those at night for their birds. The heat emitter does not emit light, only heat, making it ideal for night use. If you do choose to get a heat emitter make sure that you buy the appropriate outfit for it. You’ll want to get a holder that has a ceramic base to screw the bulb in. Otherwise you run a risk of fire as the heat emitter can get too hot to use in regular sockets. If your bird is a snuggler you can also hang a cozy tent in its cage. Cuddling up to the warm fleece at night will help keep your parrot warm during the cold months. Owners that keep their birds outdoors report the animals acclimating quickly to the outdoor temperatures. Aviary owners make sure their birds have an indoor area to get away from the elements, as well as an outdoor flight for the birds to frolic. I’ve seen many pictures of cockatoos at the rescue Mollywood in Washington choosing to romp outdoors in the snow of their flights in the winter season. Birds can acclimate much easier to cold weather then they can to hot weather. If allowed to acclimate, it is reported that they do extremely well in cooler temperatures. Your pet is hardier then you may think! But be careful of truly frigid weather, especially if the temps drop quickly ... birds need time to acclimate and definitely need added protection against wind and rain. Often times the subject of supplemental heat in the home, mainly spaceheaters, comes up as soon as the weather gets chilly. Bird owners trying to save money on heat always question the safety of heaters. Some well known brands of heaters can have teflon (PTFE) on them, so buying a safe heater can be a bit tricky if you don’t know the right questions to ask. From my experience, some options that are safe include the Optimus rotating oscillating heat fan, which the manufactuerers ensure has no PTFE on it. Some brands of ceramic heaters are said to be safe as well. Among bird owners the favorites are the ‘radiator’ type of heaters that have oil components and no teflon. Here is a good way for your small to medium size birds to enjoy some winter sun … a Wingdow Seat! These creative, durable molded plastic window perches attach to almost any window with industrial strength suction cups. They not only provide your bird entertainment but will protect him from chilly winter drafts while he enjoys viewing outside activity. Winter doesn’t have to be a stressful time, so kick back and relax! 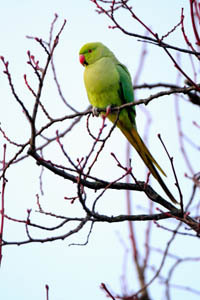 Be vigilant, and you and your feathered friends will get through another cold season comfortably warm and stress free.